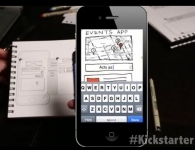 AppSeed has turned to Kickstarter to help grow their idea of turning paper sketches to prototypes, with the help of your cell phone. On this episode of Kickstarter of the Week, brought to you by National Instruments, AppSeed has turned to Kickstarter to help grow their idea of turning paper sketches to prototypes, with the help of your cell phone. The new app bridges the gap between ideas in ink and functioning prototypes through the use of computer vision.